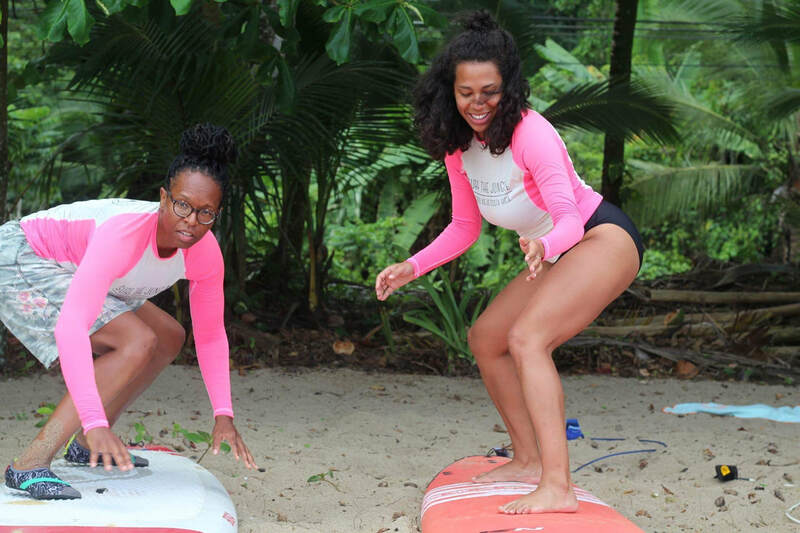 Attend a Women of Color Self-Care Retreat click here! ​Women of Color Healing Retreats was created out of the desire to connect women with nature and seeks to provide a space of learning, healing, and nurturing that so often alludes black women. In order to build sustainable communities that value the intersections of cultural identity, women of color must first rediscover who they are outside of a society that wishes to stunt organic spiritual growth and self-love. 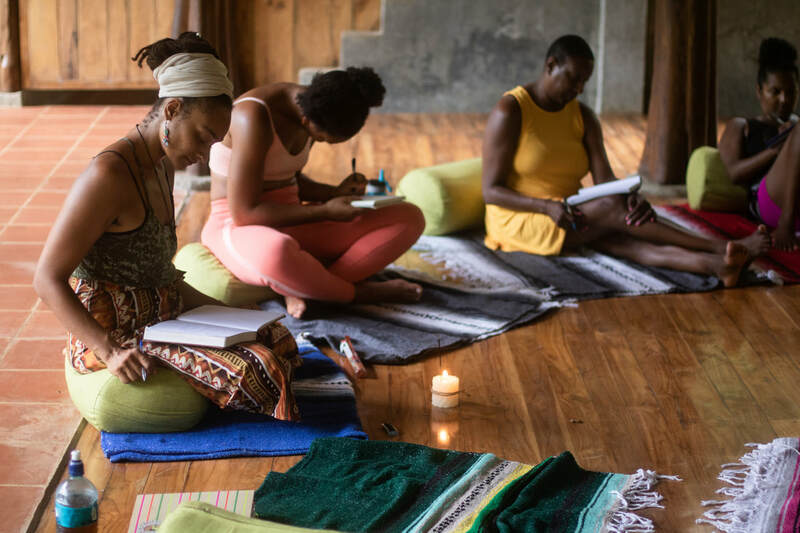 Women of Color Healing Retreats is a space for all black women, as they fully honor the diversity of black identity. It is a space for all bodies, all sexual orientations, all socioeconomic statuses, all political ideologies, and all levels of traditional or progressive black thought. 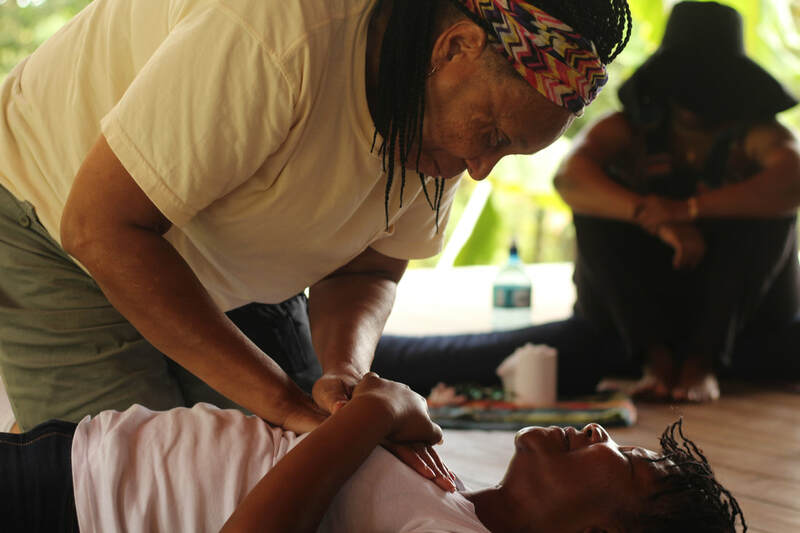 Women of Color Healing Retreats is a space dedicated to assisting black women in healing. 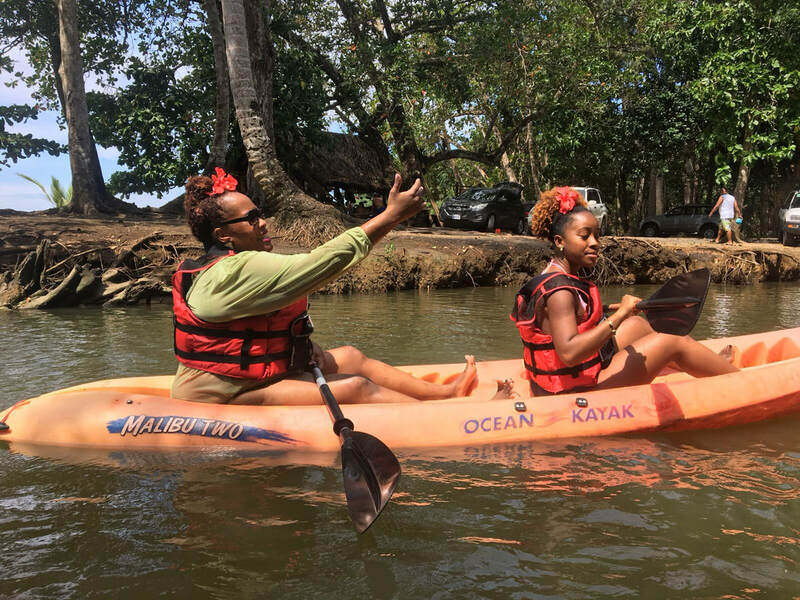 It is located outside of the United States so that black women can connect with nature, as nature is our original home. WCHR has created a space to get back to her. WCHR is also a space to unwind and disconnect from the psychological trauma of systemic racism. In a world that teaches us not to take care of ourselves, it is revolutionary and healing when we do. From daily de-colonized yoga and meditation classes. to adventures like surfing and zip lining across the majestic jungle, to beautiful group time on the beautiful beaches of Costa Rica. 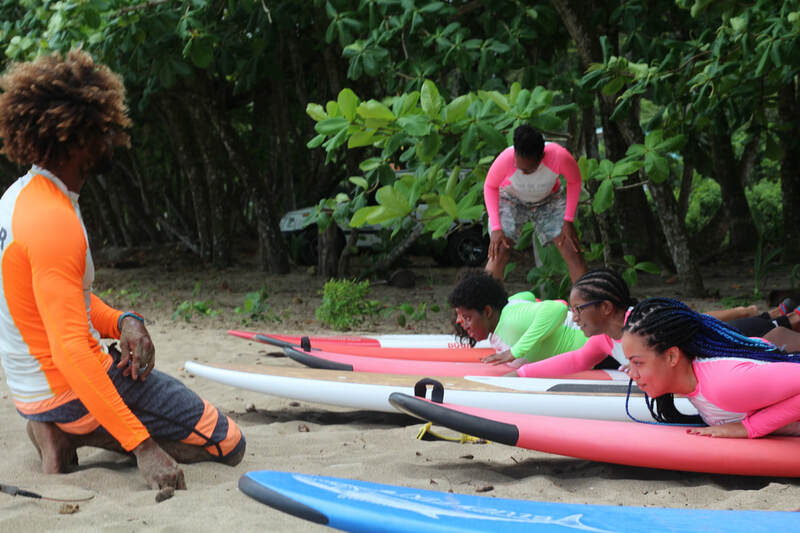 WCHR also engages our guests in the adventure side of life. 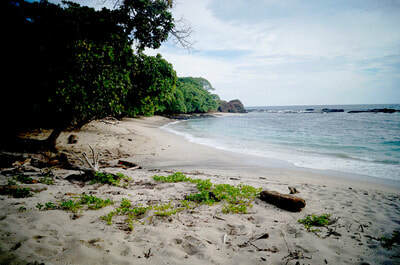 We provide the opportunity to go hiking and exploring throughout the jungles of Costa Rica. Our ultimate goal is to open the mind and heart, so WCHR provides workshops on holistic self-love/self-care, wellness, political workshops where women can unlearn/liberate themselves, healing circles and much more. The retreat will also center on navigating through the chakras. Our teachings will move you from the root to the crown by focusing on food, yoga, meditation, to open and nourish each of the body's sacred centers. If you are not familiar with the importance of the chakras and elements, then this is the perfect opportunity for you to learn. The retreat will be led by a wellness team who will hold conversations and space for the group to learn and grow together. 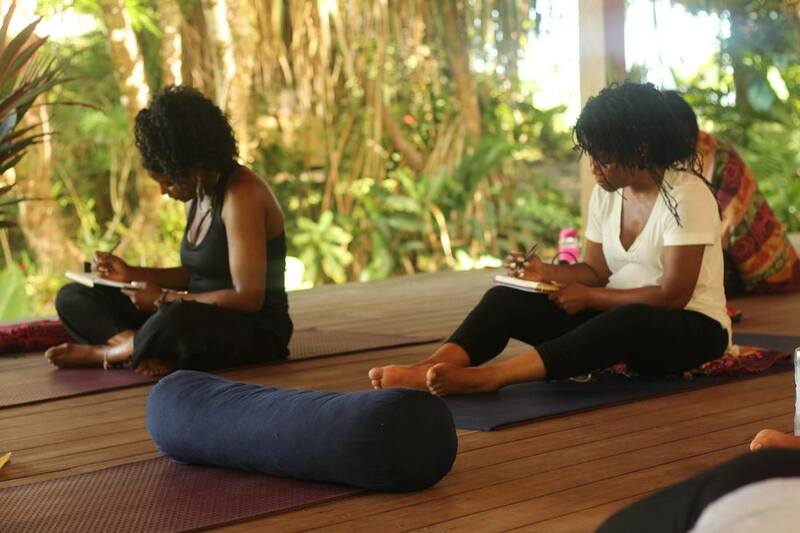 As it is important for black women to practice self-care and self-love daily, our retreat is designed to teach practical and spiritual skills that can apply to your everyday life. 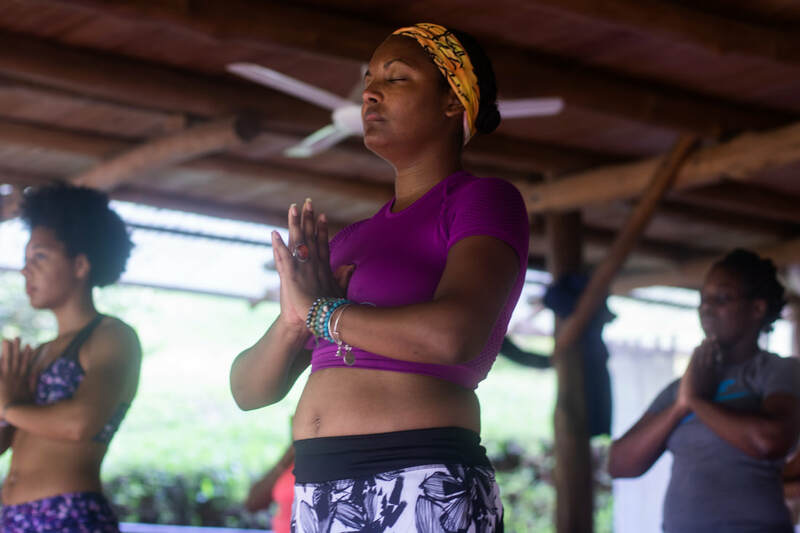 From our decolonizing yoga classes to our women's workshops, everything that you learn at WCHR can be implemented into your everyday life. Whether it be the classroom or the boardroom, we strive to provide you with a piece of the jungle’s magic so that you may have it with you anywhere you go. ​Throughout our retreats most women come in as strangers and leave as friends. We deeply overstand how detrimental the United States can be for black women and people so we are dedicated to having black women and people reset, practice self care and recharge in a community safe space and environment built on the foundation of black love. Lodging: shared accommodation at a private eco-friendly retreat location in the rain forest. This is an eco-friendly jungle escape, surrounded by nature, 10 minutes from the beach! our teachings will move you through the chakras, from the root to the crown focusing on yoga, meditation and journaling to open and nourish each of the body sacred centers. If you are not familiar with the importance of the chakras, then this is the perfect opportunity for you to learn. Daily Breakfast: Vegan Breakfast. This is for anyone who is currently a vegan and for those interested in exploring a vegan lifestyle. Healing vegan meals made with local fruits and vegetables will be provided. We provide the opportunity to explore alkaline , plant based and vegan life styles. Also offered: pure coconut juice, herbal teas, juices, superfoods and smoothies to nourish, balance and heal. Daily Lunch: Delicious healing vegan lunch, on some days we will have lunch on the beach! Daily Dinner : Fill your belly with delicious vegan and holistic meals to nurture the mind, body, and spirit with our delicious group dinners. Most of all of our delicious vegan meals are cooked, we provide raw/fruitarian options, if requested. 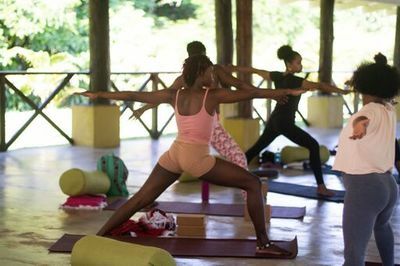 Decolonizing Yoga: Every morning and evening the group will take a guided outdoor yoga class at the lodge surrounded by the jungle. 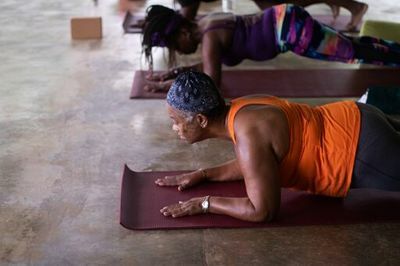 Yoga is a holistic practice that connects our mind, body and spirit. Yoga works with the nervous system, so its not just spiritually but scientifically heals. With a consistent practice, yoga has been know to cure depression, anxiety and other chronic illness. Its an ancient practice and a form of healing. ​Meditation: With a group of like minded and melanated women, you will explore self enlightenment, freedom and inner peace. Our meditations are there to guide you to a higher level of consciousness that promotes a spirit filled with vitality. We want you to vibrate higher into a space of peacefulness that is motivated by the calmness of the true treasure of yoga: pranayama. By entering into a daily meditative practice, we hope to guide each other away from the myopic shackles of a modern racist society and into the peacefulness of spiritual knowledge. Coffee Bathing at Beach: Enjoy a coffee scrub by the bluest oceans where the natural blend will detoxify exfoliate and improve the blood circulation in your beautiful skin. This holistic healing and meditative experience brings us back to ourselves and to nature. 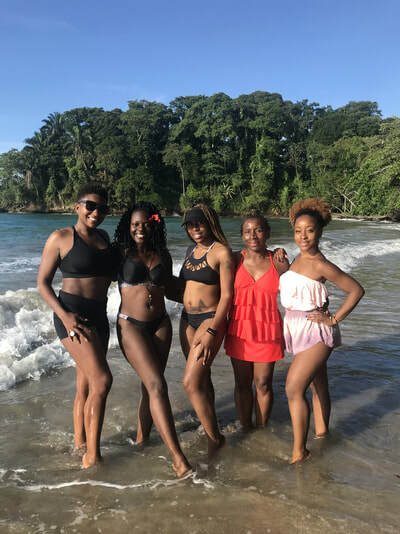 Hike and Beach: We will venture off on a beautiful hike surrounding the jungle and beach. Women circles and meditation will also take place on the beach weather permitting. Women's Circle: The women will journal, hold discussions and cultivate a safe space to heal and grow. Bon Fire (ceremony): Release all that does not serve you as you play, stretch, dance, connect with mother earth! There will be two adventure excursions at the retreat! 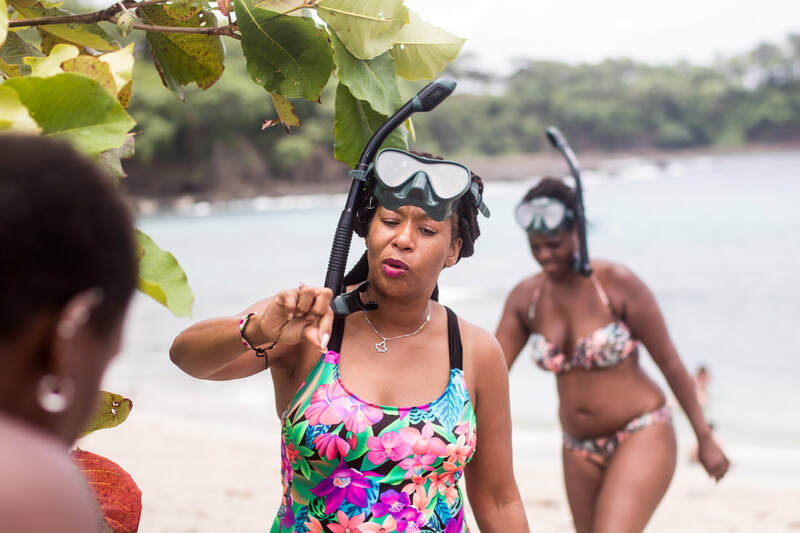 ​Snorkeling: Take a two hour snorkeling tour in the beautiful pacific of Costa Rica. Zip lining: Set amidst the unequalled beauty of a Costa Rican forest wilderness is the longest, most exhilarating canopy tour in the world. Traversing majestic mountain ridges and valleys, soaring high above multiple ravines, with breathtaking vistas of rivers, waterfalls and the Pacific Ocean. Holistic Self-Care Workshop: ​In this workshop the women will explore holistic self-care in their daily lives.The women will walk away with a better understanding of how to implement holistic wellness and holistic self-care in their everyday lives. Healing through-holistic self love and self care. Colorism Workshop: A major part of healing and understanding each other as a community is unpacking colorism because it deeply separates black women, even when pretending that it does not exist. The women will gather in a circle of support, to discuss colorism. healing all shades of brown. Inner Journey Workshop: Explore your personal energy field in this interactive opportunity to connect with yourself and your sisters. As you ground into the energy of the earth and channel your inner self, the comunal heart opens to explore and share the inner journey. Sankofa Workshop: Sankofa is an important symbolic bird in West Africa. It translates as “go back and get it” (san-to return; ko-to go; fa-to fetch, to seek and take) It represents the need to reflect on our past to build a successful future. 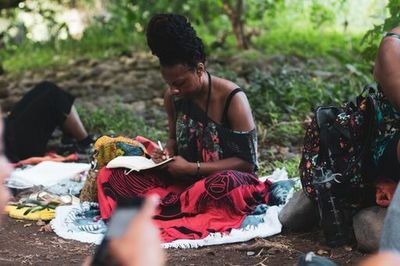 In this workshop the women will learn about our African legacies, our histories of resistance, and how we use this knowledge to envision a future for ourselves as black women. Participants will learn about resilient spiritual traditions and Orisha practice in the diaspora. We will also learn how black artists and activists today are creating works of Afrofuturism, envisioning black futures that stem from the experience of the African Diaspora. Intro to Yoga: Many people approach yoga and do not know that yoga is a spiritual practice. In this workshop, the women will learn about the spiritual principles, physical and mental aspects of yoga. Participants will walk away with a better understanding of the way yoga heals the mind, body and spirit. Intro to Veganism: This sacred, open healing session will allow participants to discuss their relationship with food in their everyday lives. You will walk away with tools on how to implement healthier eating habits for yourself, your family, and your communities. Tap Into the Ancient Power of Crystals: Gems have been around since the beginning of time, so by connecting to these stones we connect to our ancestors. In this workshop, you'll learn the ancient practice of tapping into the energy of gemstones, crystals, rocks, and minerals. We will discuss the importance of crystals in ancient Egypt and their continued usage in modern times. We'll provide an overview of common stones and their special properties. More specifically, we'll discuss the role of crystals in raising spiritual and emotional well being through explanation of the chakra energy system. Finally, we'll discuss how to use and care for crystals in your home and everyday life. Race Politics & Gender: In this workshop the women will look at Black women in the United States, our history, our stories of resistance, and how we have come to this toxic political moment. We will look at how the history of this country has shaped the intersections of race and gender and how this impacts the lives of black women today. The women will be able to use this knowledge to heal themselves and their communities. Exploring Meditation Modalities: In this workshop , the women will learn how to meditate, the history of meditating, guided zen, breath work. They will be able to go home with tools for a personal meditation practice. ​all workshops, accommodations, activities etc. may be subject to change. WOCHR was built as a community for all black women, whether its the black girl that felt she could never relate to other black women, or the pan-africanist that only thrives in black spaces. Our retreat aims to bridge the gaps that have been built to divide black women with the goal of bringing us together in direct fellowship. ​WOCHR is a vegan retreat, all meals are cooked with quality ingredients. Animal by products are not allowed within the retreat space , no exceptions. As we abstain from animal by products in the WOCHR kitchen, we also abstain from alcohol throughout the retreat. This abstinence will be in effect whether guests are in the retreat lodge, or are enjoying some well needed personal time. Our goal for the alcohol cleanse, is to keep the vibrations high. 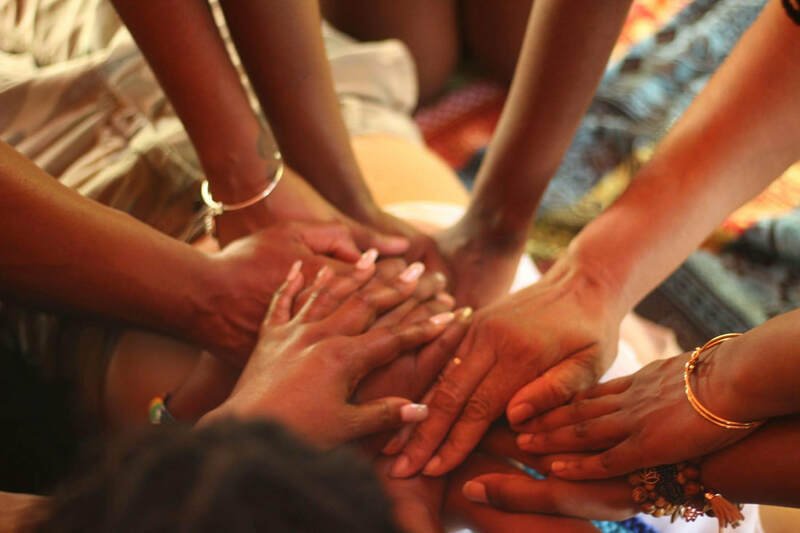 This is a space dedicated to assisting black women on their spiritual/healing journey. We are each responsible for ourselves. We are responsible for showing up each day. In personal responsibility it is your duty to make sure you use this space to go within while building community with your sistars. This is a time to disconnect so that we may reconnect with our highest selves. We are responsible for our own wellness and healing, WOCHR provides tools that can be used to assist in self love and healing but ultimately, A healer does not heal you, a healer holds space for you to awaken your inner healer so that you may heal yourself. We are elated to have you join us in the replenishing jungles of Costa Rica. During your free time you can read a book, journal, make a coffee scrub, take a dip in a river. We encourage you to be fully present during your experience. 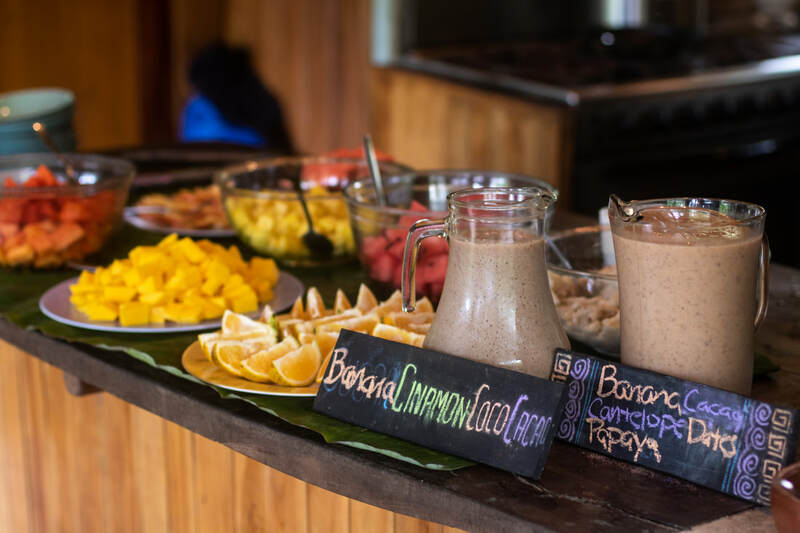 Alya Retreat Center is a mystical eco-friendly lodge located in the beautiful rain forest 10 minutes from the beach! Every morning you will wake up surrounded by lush green jungle and birds chirping. Your lodging accommodation is included, along with delicious custom-made vegan meals. Lay in a hammock, stretch, write in your journal and do what makes you feel good. All cabins are shared and include hot water + bathroom, deck or patio, jungle view and can accommodate 2-3 people. 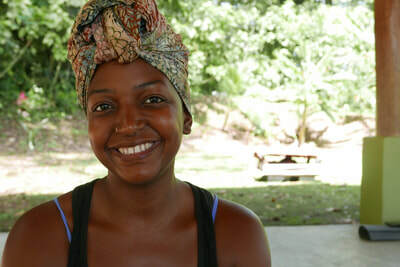 Women of Color Healing Retreat is a holistic wellness retreat dedicated to black women in the jungles of Costa Rica, making this a true jungle escape.When you attend a WOCHR or any of our retreats/events, be confident in the knowledge that you are truly supporting black communities through and through. 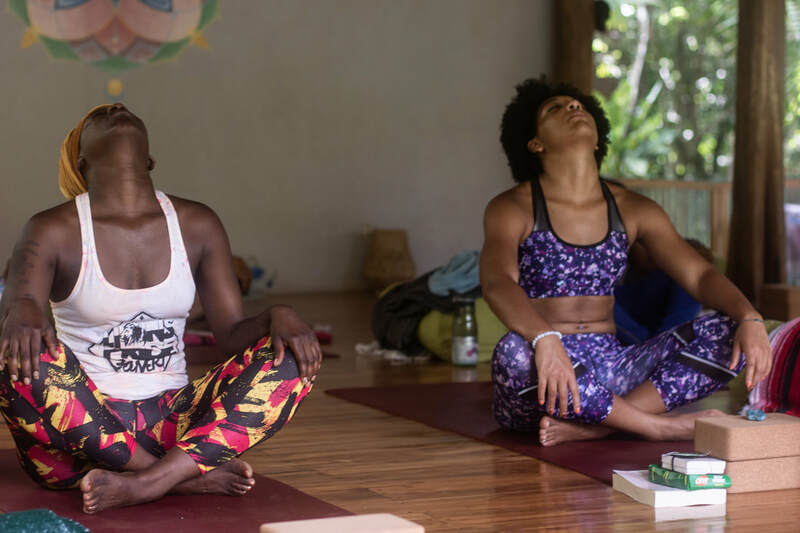 Women from all walks of life attend our retreats to practice healing themselves and each other.During this retreat, women enjoy enrichment-centered workshops, eat nourishing plant-based meals, go on hikes, and practice yoga and meditation daily. Yoga is an ancient healing tool scientifically proven to heal depression and anxiety. While yoga is a key component to all of our retreats, experience in yoga is not required to attend the WCHR. Additionally, this retreat has adventure activities. The WCHR is a sacred space for black women to learn about holistic wellness and to unwind from the psychological trauma of systematic racism. This retreat is a space where black women can be their authentic selves surrounded by those who share their experience. 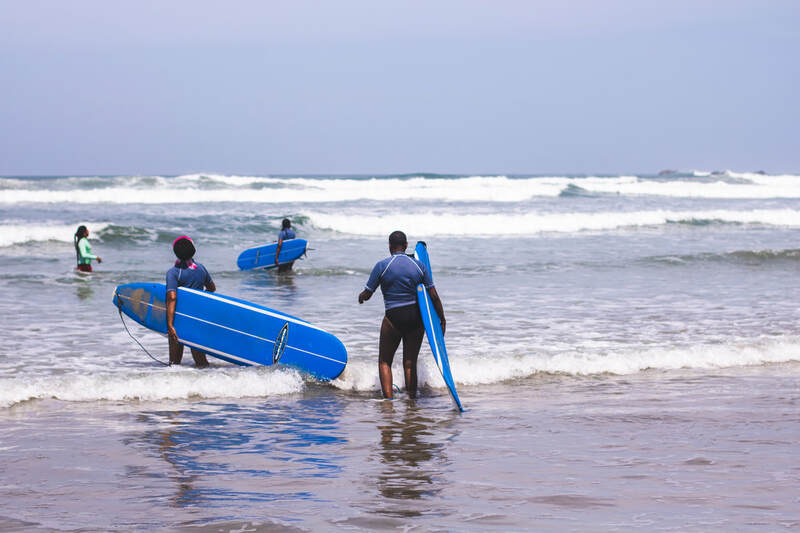 Click here to see what a day at Women Of Color Healing Retreats will look like! ​A holistic wellness lifestyle is one that aims to achieve an inner balance of mind, body and spirit, using natural healing methods such as yoga, meditation, plant-based living and self-reflection. "Holistic self-care is possessing enough self awareness to correct the behavior of over-functioning for others while under functioning for yourself." Be sure to click the link below to book a retreat. You will be redirected to our email address where we will assist you on booking!